a cutting board <- Must Have. 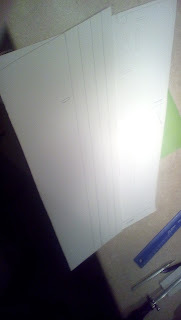 Notes for cutting foam board: It is a very annoying and long winded process, but it is well rewarding if you do it right. Lightly score the top of the area you want to cut many times, going deeper each time. Turn your exacto knife so the cutting edge is flat in the score you made. VERY QUICKLY pull it across the score and it should go through. 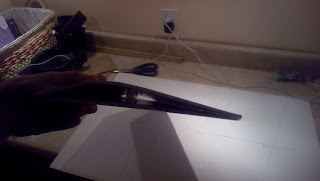 Then point the exacto knife straight down and poke it through; pull it through till the part is free from the wing. 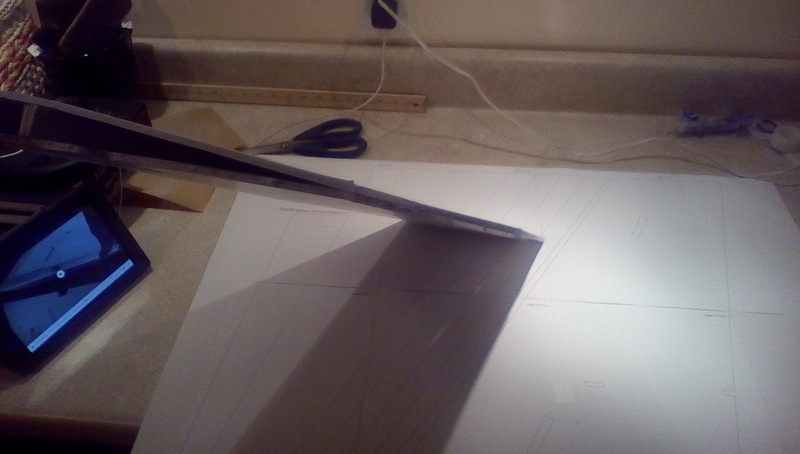 If you do this correctly you should have a moderately good cut through the foam board. I will also say, you need the blade to be very sharp; I had to sharpen mine every time I cut. 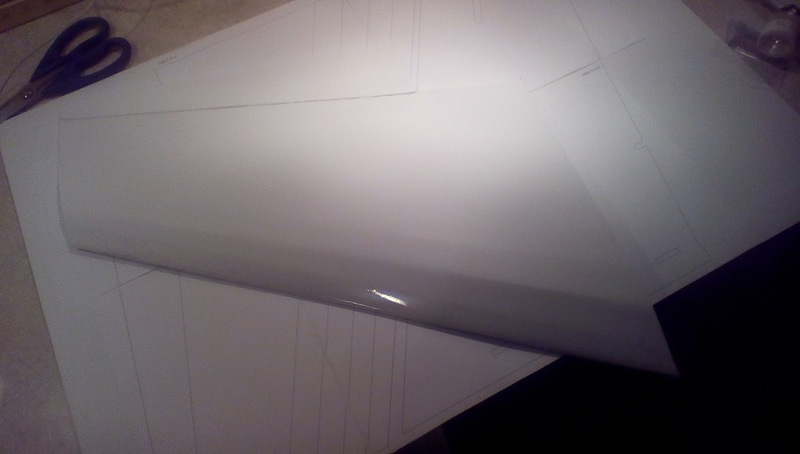 I have had much trouble with printing these correctly due to the size of each page (8x10). I have had no luck printing on linux but instead had to go to a windows 7 computer to print. Once you have printed the 16 pages, lay them out, and 1 by 1 trim them down to 8x10 using the dotted lines. 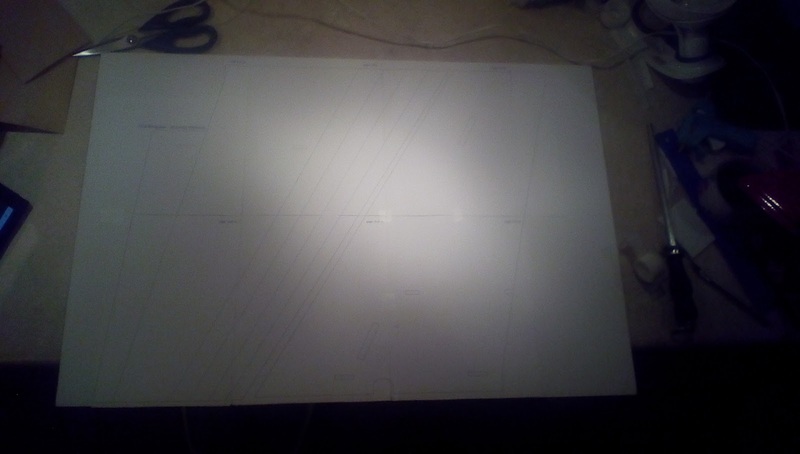 Once you have downloaded, printed, and cut out the plans, lay them out on 2 sheets of foam board. 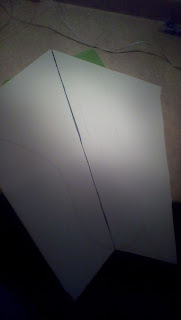 The easiest way I have found to do this is to separate the two wings and then lay them out on the foam board. 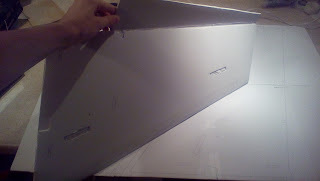 Here is a picture of the second wing all layed out on the foam. Either using the color code on your computer, or using the colors on the paper, carefully cut the places listed. One problem I ran into here was when it asks to 'score' or cut 50%. The area that it asks you to 'score' near the elevon I would suggest cutting completely. 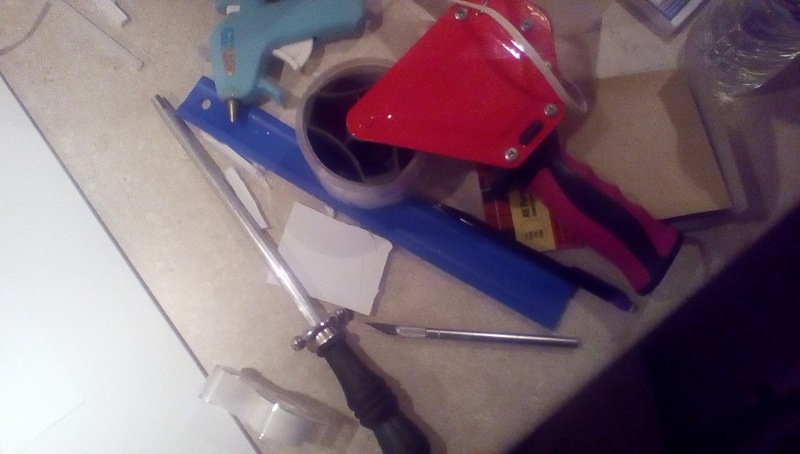 Once you cut that off, just replace it with tape later when you connect your servos. Also, using a scrap piece of the leftover from your wing (or both wings) you can cut out the spar for the inside of the wings. 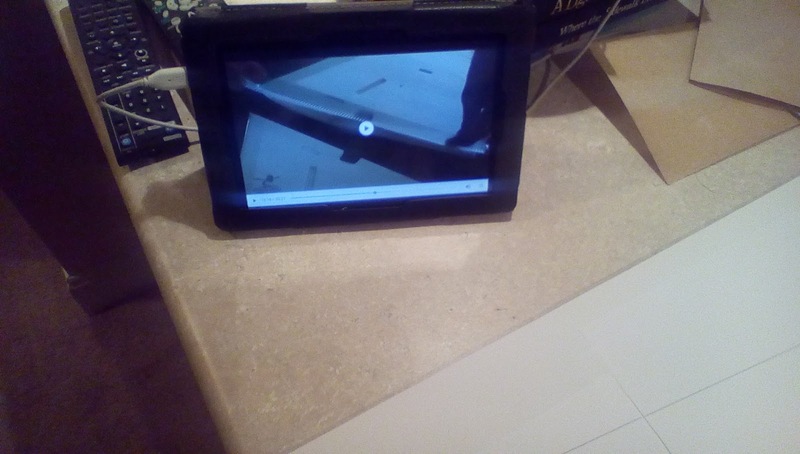 At this point, you can pretty easily follow the FliteTest tutorial video because you have all the parts they are using. 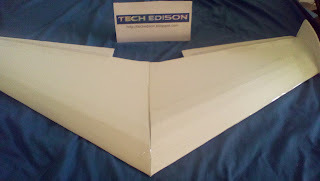 Once you have built 1 or both of your wings, you can use a piece of tape on the top to reconnect your elevons. Not only is this stronger than scoring the edge, it is also more flexible and it is changeable later on. Finish the tutorial video to finish your plane. 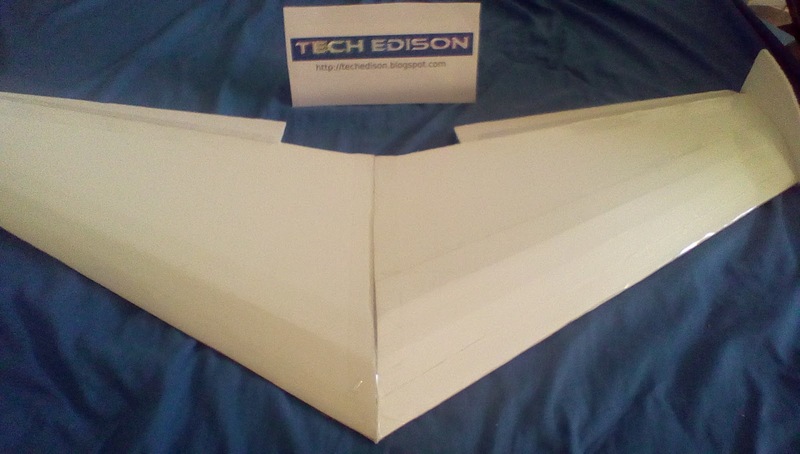 Cut any extra pieces you need out of your 3rd 20x30 piece of foam. NOTE: You will need 3 pieces. The winglets can not be cut out of scrap from the 2 wing foam board pieces. Relax and feel accomplished. 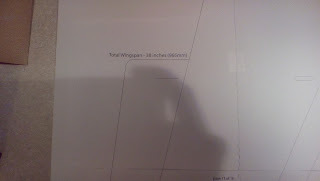 The parts list at the top will give you an idea of what you have to buy to get this plane off the ground.